PLEASE NOTE: DUE TO SAFETY REASONS THIS WHARF IS CLOSED PERMANENTLY. FOR FURTHER INFORMATION PLEASE CONTACT THE HARBOUR AUTHORITY. 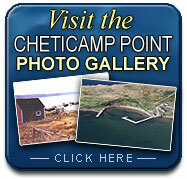 Cheticamp Point was a fishing harbour located on Cheticamp Island. c. 1750 During the summer months, the Jerseymen ran a fishing camp on Cheticamp Island. c. 1770 The first to establish a permanent fishing post on Chéticamp La Point (known as Chéticamp Island) were the Robins (merchants from the Island of Jersey, situated in the English Channel, off the coast of Normandie). It was near 1770. Chéticampers always called these merchants “les Jersais” (deformation of Jersiais, meaning “of Jersey”). At the time, the fishing post was operational mainly during the summer and autumn season. Fishermen would come from as far as Prince Edward Island or Arichat to fish during these seasons.